If anyone had told me I would be making pizza bases from cauliflower a year ago, I would have laughed but they are unbelievably tasty and healthy to boot. 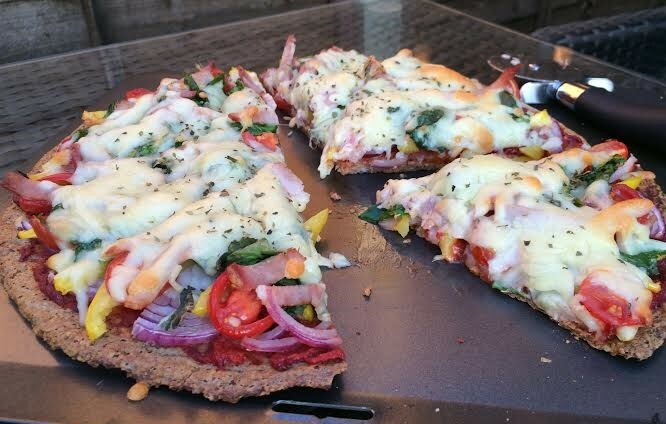 Imagine a “healthy” pizza which tastes good! I spotted the recipe in the cookbook The Art of Eating Well (Hemsley & Hemsley) and couldn’t wait to try it out. They were so delicious, easy to make AND I could make 4 bases from one cauliflower, that my freezer now has a stack of them ready for grabbing for either a quick lunch, or a light evening meal. I freeze them in between parchment paper and top them whilst still frozen. They don’t taste too cauliflowery and are perfect for almost any toppings. Either grate the cauliflower into rice-sized pieces using a hand grater, or as I prefer pop into a food processor and blitz. Add all other ingredients and blend to form a sticky dough. Draw a 30cm (approx.) 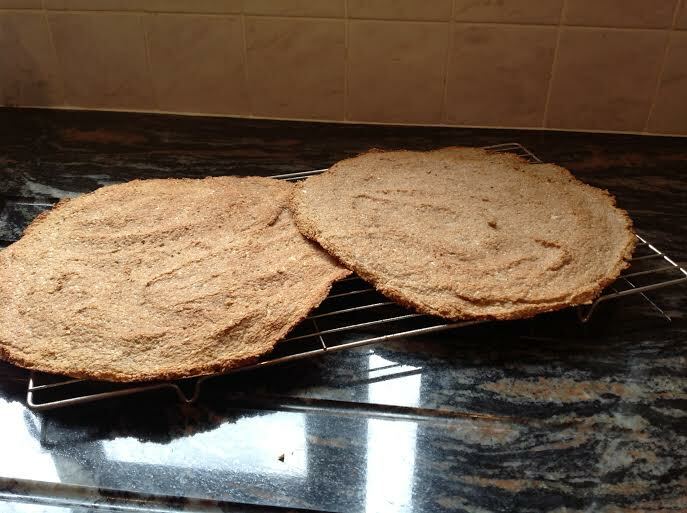 circle on a piece of baking parchment and spread the dough out with the back of a spoon to fill the circle. Slide the parchment onto a baking sheet and bake for about 20 minutes at 190°. After about fifteen minutes, take out of the oven, pick up the parchment with the pizza base attached and turn it over and peel off the paper. Return to oven to finish cooking. Spread the base with either tomato paste or passata or make your own sauce by frying 3 diced garlic cloves in coconut oil, adding 12 large tomatoes roughly chopped, 2 teaspoons dried oregano (or 1 tbsp fresh), sea salt and black pepper and 1 fresh chilli chopped (optional). Cook this for about 15 minutes and either mash or blend. You probably won’t need all of it so freeze the remainder for next time. 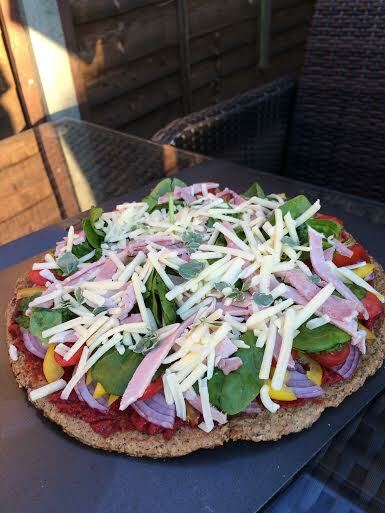 Add your favourite ingredients for pizza, such as sliced onions, sliced peppers, mushrooms, ham, pineapple, spinach, spicy chicken, parma ham, rocket etc. Top with a sprinkle of either cheddar or mozzarella cheese and plenty of fresh oregano. Pop back into the oven for 10 to 15 minutes to heat through and melt the cheese. Pile the toppings as high as you like! Serve with a large, green salad. 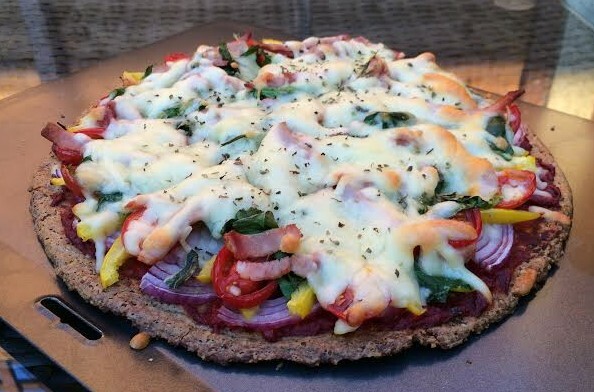 This entry was posted in Dinner, Lunch and tagged Cauliflower, Cooking, Gluten Free, Healthy Eating, Pizza, Recipes, Wheat-Free. Bookmark the permalink.